We are so glad you have come to visit. 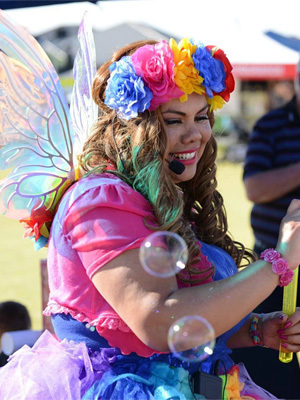 ‘Ruby Rainbow the Fairy’, is a professional and reliable Children’s Entertainer who has hosted hundreds of events across Perth. Ruby and has extensive experience in children’s party entertainment including, face painting, balloon twisting, puppetry, magic and more. Ruby brings the party fun right to you, whether that is at your home, a park or any venue you choose. Ruby Rainbow loves to entertain children at parties but is also available for Corporate Events, Private Functions, Christenings, Festivals, Family Fun Days, Shopping Centres, Childcare Centres, Schools, Store openings, Weddings, Roving Entertainment and Christmas Parties. When you hire Ruby Rainbow, you have her personal guarantee that your child will have the best, most fun party ever, leaving you to enjoy the party along with your child, completely stress free!